BARCELONA, SPAIN--(Marketwire - Feb 25, 2013) - Audience®, Inc. (NASDAQ: ADNC), the leader in advanced voice and audio processing for mobile devices, today announced the earSmart eS325 -- the company's highest performing Advanced Voice processor. The earSmart eS325 features the newest technologies necessary for the best-sounding voice experience on many of this year's most highly anticipated mobile devices, and delivers innovations in real-time communications, speech recognition and media capture. This new Advanced Voice processor is expected to ship in commercially available smartphone platforms by the end of April 2013. The earSmart eS325 is the first Advanced Voice processor to feature a combination of industry-leading innovations such as simultaneous three microphone processing, optimized Automatic Speech Recognition (ASR), Mobile Audio Zoom, Super Wideband support for Voice over IP (VoIP) and Enhanced Stereo Recording. 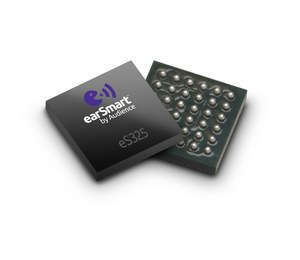 The earSmart eS325 also features Bandwidth Expansion technology for a consistent, HD-quality voice call experience when moving between 3G and 4G networks, while also meeting the tighter latency requirements of the European HD Voice standard, ensuring minimal delay for more natural conversations. "The Audience earSmart eS325 raises the bar for mobile voice quality, delivering a host of exciting features and technologies that transform a consumer's experience of using speech to communicate, interact and connect through their mobile device," said Robert Schoenfield, vice president of marketing and business development, Audience. "With many leading manufacturers already engaged with us, we expect to see the earSmart eS325 Advanced Voice processor play an important role in this year's most exciting mobile devices." "Due to the importance of voice in so many key applications we expect things like three-microphone support and voice processing to come to most high-end smartphones," said Ben Bajarin, Principal Industry Analyst, Consumer Technology and Market Trends at Creative Strategies, Inc. "Technologies like these not only increase the quality of the sound experience overall but set the stage for next generation voice processing and recognition technologies which are critical to the future of smart devices." Three microphone performance improvements of approximately 30% to 55% signal-to-noise ratio improvement (SNRi) in noisy environments.1 In optimal conditions, Audience's tests show SNRi improvement of up to 80% over two microphone-enabled, previous generation products. Dramatically improved consistency of voice quality when mobile device is held in a variety of different positions. True three microphone support - enabling all three microphones to be used simultaneously to gather more environmental information, suppress noise and deliver exceptional voice quality. ASR Assist technology - dramatically improves the user experience of speech-enabled applications such as virtual assistants and voice search. De-Reverb - removes the echo effect in spaces such as conference rooms and hallways. Audio Zoom - the world's first selective audio capture feature for mobile devices that allows consumers to record in an "interview" mode while suppressing noise and capturing both voices with crystal clear accuracy. Super Wideband - for crystal clear VoIP calls in nearly any environment. Enhanced Stereo Recording - an advanced, industry-leading two-microphone 48 KHz noise suppression implementation for recording clean, high definition audio. Statements in the press release regarding Audience, Inc., which are not historical facts, are "forward-looking statements" within the meaning of the Private Securities Litigation Reform Act of 1995. These forward-looking statements may be identified by terms such as believe, expect, may, will, provide, could and should and the negative of these terms or other similar expressions. These statements, including statements relating to expectations of future success for various products and our leadership position in the market, the demand for our solutions including continued demand by customers upon whom we are substantially dependent and diversification of our customer base are based on current expectations and assumptions that are subject to risks and uncertainties. Our actual results could differ materially from those we anticipate as a result of various factors, including: our need to maintain and expand our existing relationships with our OEMs and to establish relationships with new OEMs; competition in the market for our products; our lengthy sales cycle and the lack of certainty as to whether any given OEM's products will achieve market acceptance; our OEMs' lengthy and expensive process to qualify our products; our reliance on other parties to manufacture, assemble and test our products; defects that may be present in our products; the impact of future intellectual property litigation and claims for indemnification; and other risks inherent in fabless semiconductor businesses. For a discussion of these and other related risks, please refer to "Risk Factors" in our most recent Form 10-Q, which is available on the SEC's website at www.sec.gov. Given these uncertainties, you should not place undue reliance on these forward-looking statements. Also, forward-looking statements represent our management's beliefs and assumptions only as of the date made. You should review our SEC filings carefully and with the understanding that our actual future results may be materially different from what we expect. Except as required by law, we assume no obligation to update these forward-looking statements, or to update the reasons actual results could differ materially from those anticipated in these forward-looking statements, even if new information becomes available in the future. 1 Using industry standard distractors, in Audience tests the three microphone earSmart eS325 performance shows an SNRi improvement of 55% in street noise, 33% improvement in music and 32% improvement in a babble environment as compared to the two microphone earSmart eS305 performance . 2 As compared to previous generation earSmart eS305 technology in Audience tests.